This is real cranberry relish. Fast and easy, healthy and delicious. Give it a try! Sweetener, to balance tartness. Depending on the sweetness of the apple and orange, this may not be needed. Place all ingredients in food processor. Process until evenly chunky. Chill and serve. A variation is adding one jalapeno pepper for a nice southwest flavor. These recipes feel a little like cheating. They are so easy that I almost think I should not include them here, but I don’t want people to overlook these. Peel the sweet potato (and of course, these instructions are true for white potatoes.) Cut them into slice 1/4-1/2 inch thick, then cut them again at the same size to make the fries. Rinse under cold water, then place in a bowl. Fill with water and ice. Let them chill for 30min to overnight. Get the oil hot, 325F/162C. Use an oil that remain liquid at room temperatures (canola, corn, safflower or peanut work very nicely.) Drain the water off the potatoes, and using a clean cotton towel, get the fries as dry as possible. Carefully place in the oil. Let let cook for 6-8 minutes. They will start to get limp. Remove them from the oil and let drain. set them aside to rest. Turn the heat up to 350F/175C. When hot, place the fries back in the oil for 1 minute. they will quickly get golden brown. Serve immediately. 1 medium onion, slice thinly. Place everything in a non-reactive bowl (glass is best). I try to find low sodium versions of the vegetables. That way, if you need to add a bit more, you are in control of how much is added. Mix the dressing (equal parts vinegar and sweetener.) I make it in small amount ata time until I get enough. How much is enough? Hard to say, but after placing all the vegetables in the bowl, you want to add enough dressing to come about 3/4 of the way to the top. It’s okay if not everything is submerged. The onions will get soft and collapse, and the beans will give off their own juice. Mix together, season as needed, cover and refrigerate overnight. This is a salad that tastes better a few days after making it. Most of the calories and carbs are from the kidney beans. I served these sides with burgers, fresh off the grill. I dressed my bun with Vidalia onion and avocado slices (on the bottom bun) with a dollop of coarse German mustard on top of the meat. Bring a large kettle to a boil. Salt the water. When boiling, add the pasta and cook until “al dente”, 8-10 minutes. While the pasta boils, fry bacon until crispy. Chop and set aside. Pour off all but 2 tablespoons bacon grease. Drain the pasta, saving 2 cups of the pasta water. Return the hot pasta back to the kettle. Add the arugala and stir gently. Add the tomatoes and garlic, the green onion and one cup of the reserved water. Stir to mix. Top with bacon, and more pasta water if you think it needs it. This can be served warm or cold. You can increase the health benefits by using a high fiber pasta, but Tammy and I don’t eat pasta that often and we simply prefer the “regular” white pasta. I used a meat thermometer, the type that stays in the meat while it is cooking, and is connected to a meter outside the grill or oven. If you do any amount of roasting, either grill or oven, I really recommend that you use a thermometer like this. You can set it to ring at your desired finished temperature and you will never overcook your food again. 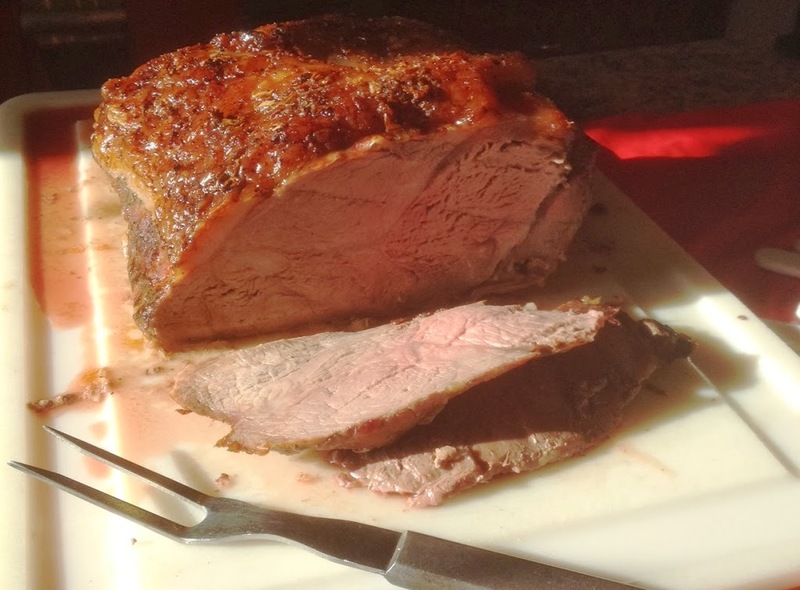 The roast was the main part of the meal, and the part I was most stressed about. Everything else went smoothly. Tammy would pop into the kitchen from time to time, just to make sure everything was progressing. I made a loaf of bread which finished at the perfect time for me to start roasting the carrots. They take about 25 minutes under 450F and then another 10 minutes after adding the peas to the pan. I dumped two pounds of fingerling potatoes onto a shallow jelly roll pan, drizzled olive oil, tosses with some salt and pepper and put it on the bottom rack of the hot oven. When I added the peas to the carrots, the potatoes were sizzling, and when the carrots were ready, so were the potatoes! Whew! I hope everyone enjoys your new year! I will still be here! I left the deli without potato salad but with a container of the Bacon-Cheddar Popcorn Salad in my cart. It was really good. 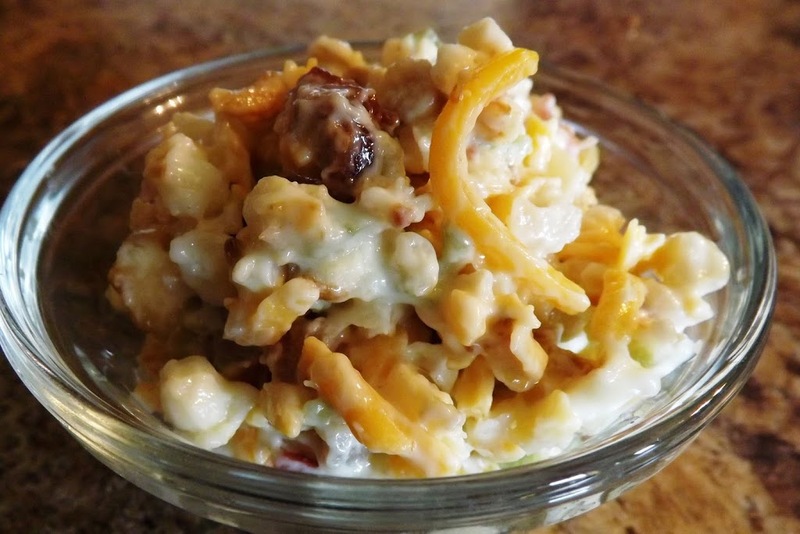 A definite ranch-ish flavor, built on fresh popped popcorn, a lot of bacon chunks mixed with shredded cheddar cheese and diced scallions, all in a mayo-type base. I don’t have a recipe yet. And I don’t know if I want to toy with this. Maybe the secret will be to use this salad as a reward on rare occasions and just limit how much I eat. I don’t know. But it is fun to find such unique combinations of favorite foods. How can I make that recipe, but make it healthier? (In other words, low sodium?) I can use low-sodium bacon (that is the bacon of choice here at home), but the cheese and mayo is sodium heavy. Would it be worth making my own mayo from scratch and leaving salt out? Place greens in a bowl. Add dressing, toss to coat. 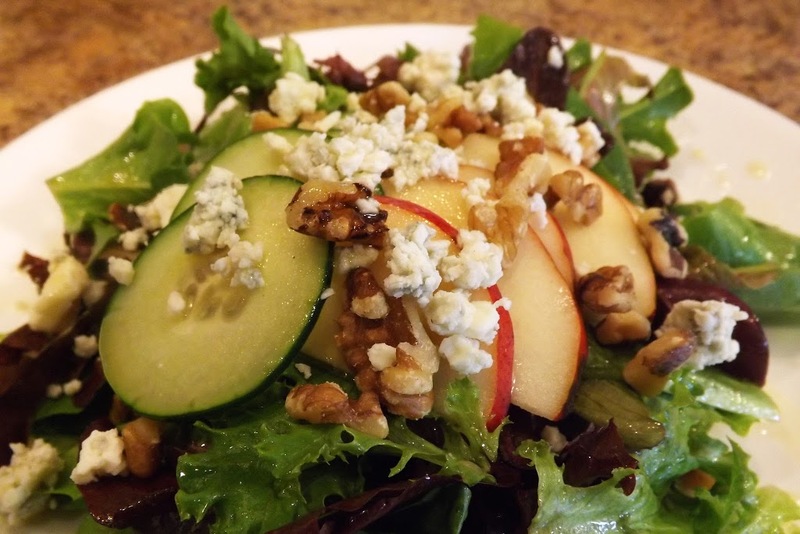 Add equal amounts of pears, cucumbers, walnuts and bleu cheese to each. Such simple ingredients. 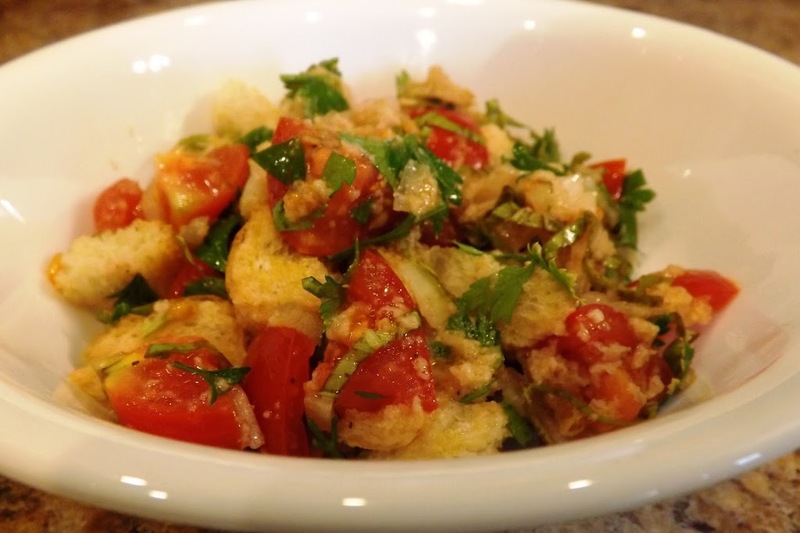 Stale bread, ripe tomatoes, onion, basil, olive oil and vinegar. It’s amazing how basic items can be used to create delicious food and good lives. We talk about make simple changes on MakeYourSomedayToday, my twice a week motivational podcast. Combine first three ingredients in a small bowl and set aside. Combine the last five ingredient in a bowl. Toss to mix. Pour the dressing on top, toss and let the bread soak up the dressing for 3-5 minutes. Note: you can use any bread that you prefer. I use Healthy Life’s High Fiber because of the good fiber content along with the low calories and sodium. It also tastes good, dries well, and is easy to find in stores. 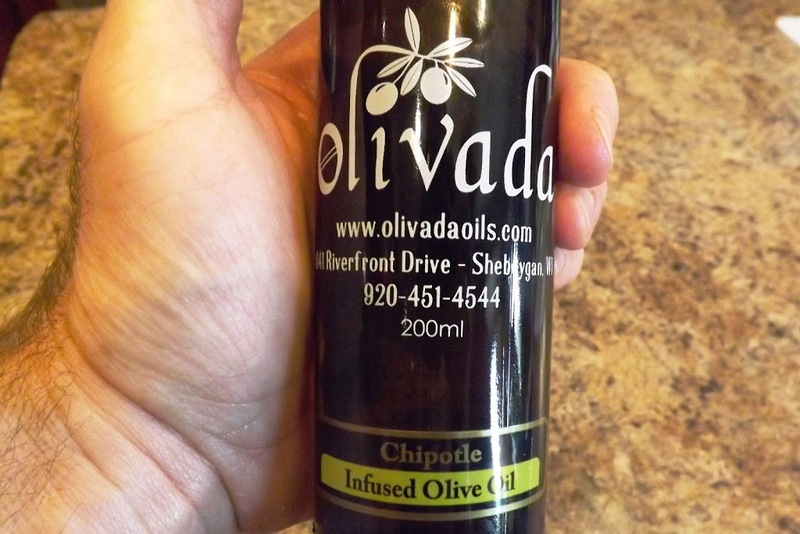 I used a very high quality olive oil from Olivada Oils in Sheboygan, WI which was a Chipotle Infused Olive oil. It gave this salad a delicious heat and a nice kick to balance the sweet tomatoes and tart vinegar. You are abandoned on a deserted island. Which THREE vegetables would you bring (and only three veggies, no fruits)? After I get responses from at least 10 people, I will tell you my three choices. Make Your Someday Today is a twice-weekly podcast, where we talk to successful people in all walks of life and around the world on Monday, and then on Thursday, I take a specific message from the previous guest and give my “Trevitorial”, where I help you apply that message to your life. The entire purpose of the show is to help all of us overcome our challenges and fears and become the person we want to be, the person we deserve to be. 1 large head of leaf lettuce (red or green), torn into pieces, carefully rinsed and laid out to dry. Place lettuce into a large salad serving bowl. 4 strips of cooked bacon, chopped. Just before service, place in microwave and bring to a boil. Stir to make sure the sugar is dissolved. Pour over prepared salad and toss to coat. 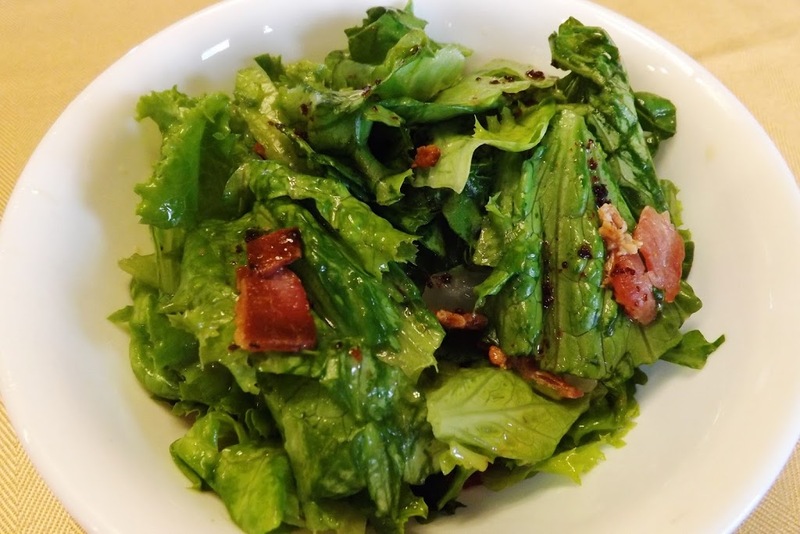 The salad is ready when the lettuce is starting to wilt from the heat of the dressing. Would you prefer this with beef, pork, chicken or fish? Why? Life is busy. But that does not mean we can’t eat wonderful food! Preheat your grill on high for 5 minutes. Brush your grill and using paper towel and a tongs, wipe vegetable oil on the grate to prevent sticking. Lay the cheese on the grill. Flip after two minutes. The cheese will not melt into the grate, but will brown as in the picture. Remove after another two minutes. Lay the tomato slice on the arugula. I cut the halloumi into strips and laid over the tomato. 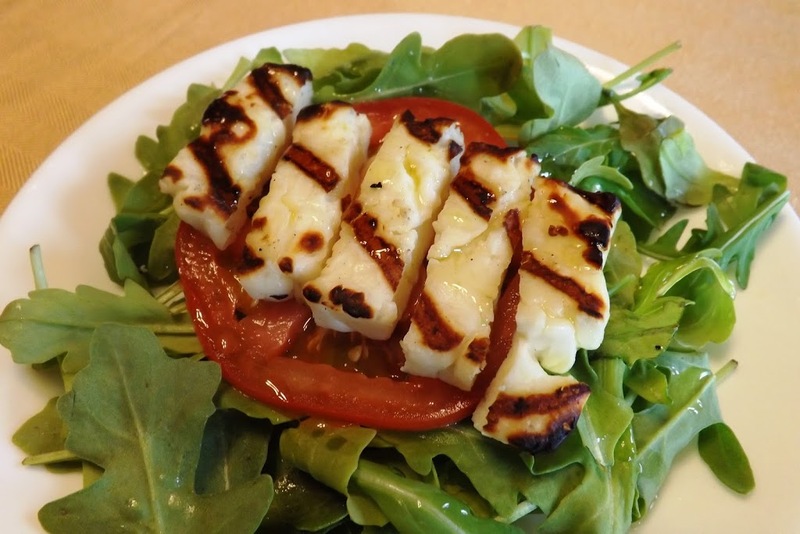 By the way, halloumi cheese originated in Cyprus, and is a blend of cow and sheep milk. It has a very high melting point because it is heated and shaped before being brined. Because of the brine, it is salty, which nicely offsets the spicy/peppery arugula. The light drizzle of olive oil is all this salad needs for a balanced flavor profile. Remember Last Friday’s recipe? The Grilled Chicken and the Hoisin BBQ sauce? Well, this recipe uses 2 left over chicken quarters and the remaining Hoisin BBQ sauce. Skin the chicken and remove the bones. Roughly chop the chicken. Pour the BBQ sauce over the chicken and stir to coat. Warm in the microwave until it reaches the temperature you want. Think of your favorite Asian dish. If you liked the veggies in it, you will like it on the salad. Top your veggies with half of the chicken/BBQ mix. 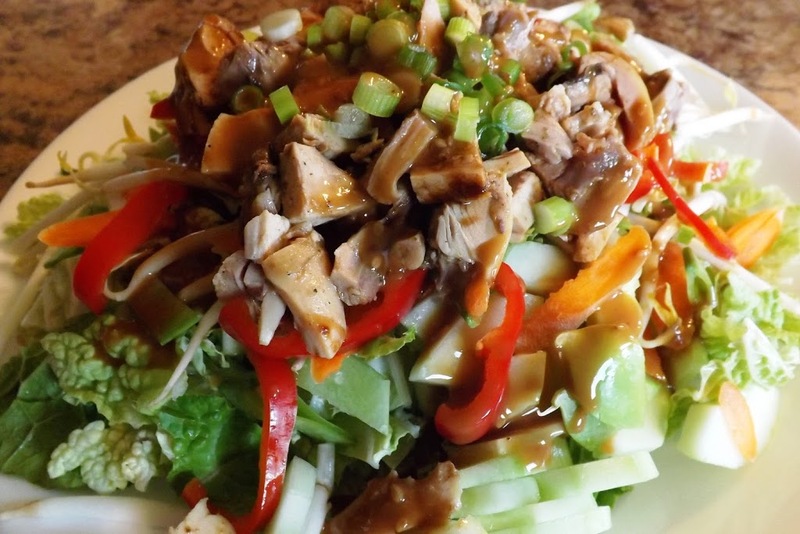 If you want more dressing, you can use your favorite Asian-style salad dressing, or simply make more of the BBQ sauce. Since the calories and other nutritional data will vary based on what you choose and the quantities used, I am not going to give any nutritional data. Like any salad, the calories are concentrated in the dressing. Use as little as you can get away with, and you will have an full-flavored, low calorie meal, that uses up leftover chicken in a way that maybe you never considered.